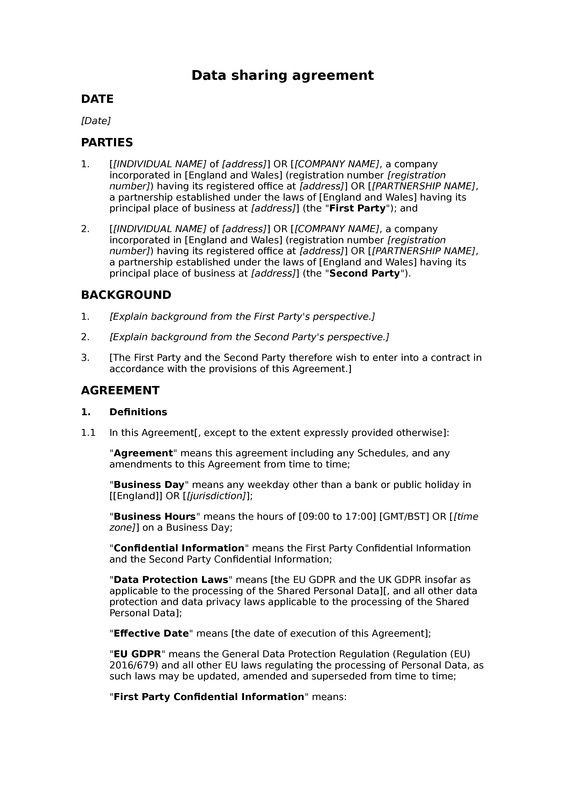 This agreement will help you to regulate the sharing of personal data by two companies or other organisations, where each party will act as a controller with respect to the shared data. 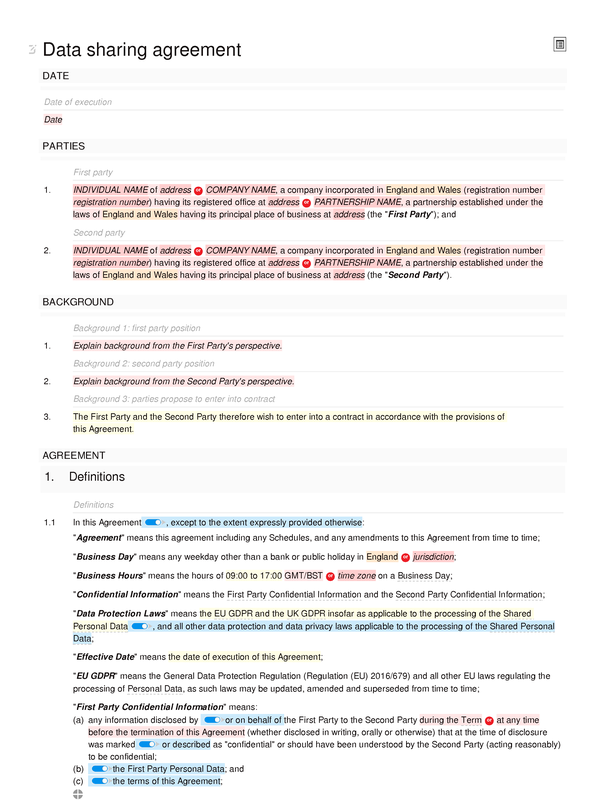 The document may be used whether the parties will exercise their authority as controllers independently or jointly. 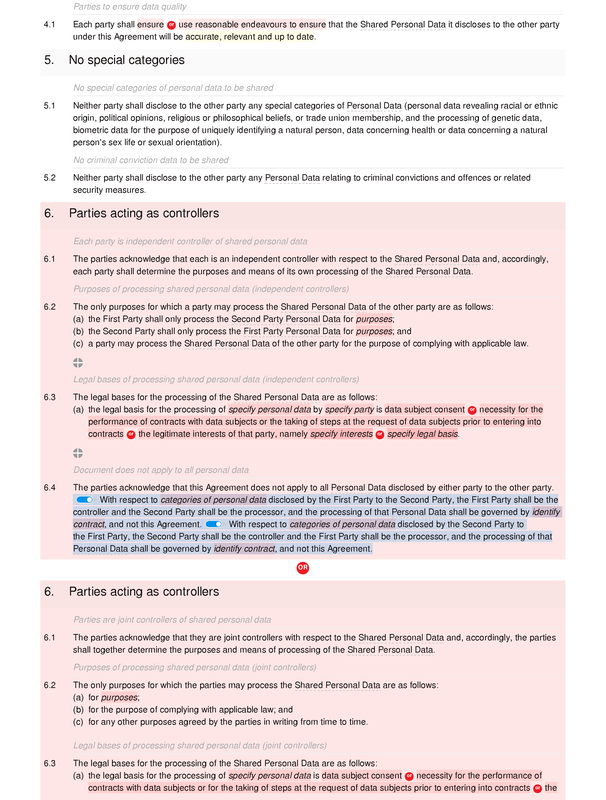 Unlike in the case of controller-to-processor transfers, there is no mandated set of clauses which must be included in contracts that govern controller-to-controller transfers. Indeed, in some cases it is not necessary to have a contract at all. 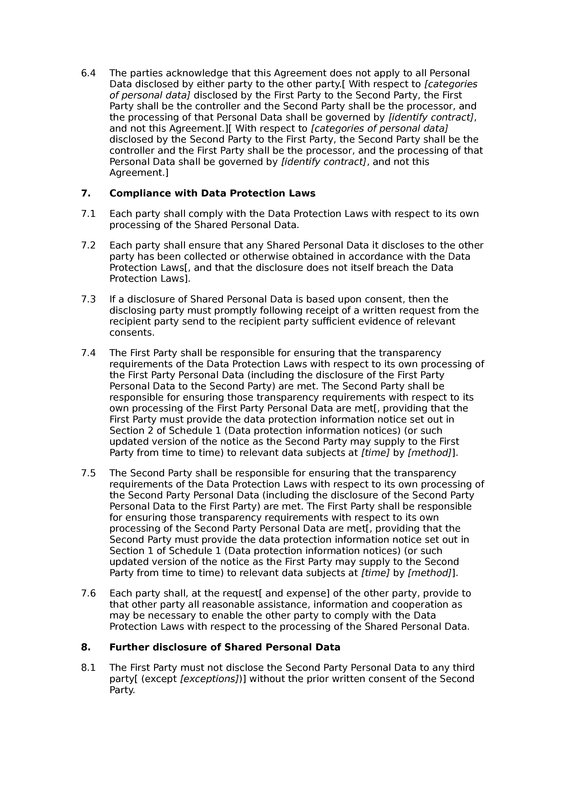 However, some of the controller obligations set out in General Data Protection Regulation (GDPR) will be engaged in relation to such transfers, and in appropriate cases a data sharing agreement will help the parties to meet those obligations. Such an agreement will not, however, always exhaust the parties obligations under the GDPR. 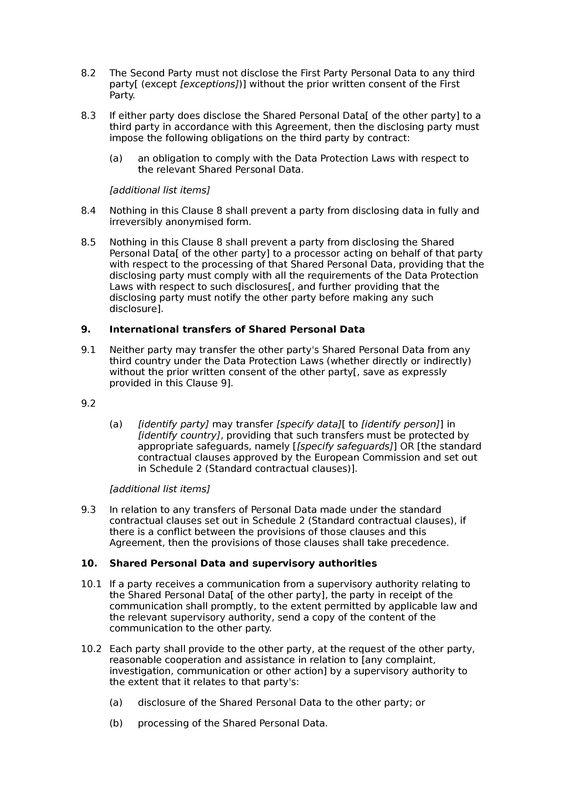 For instance, a data protection impact assessment may be required before a sharing arrangement is instituted. 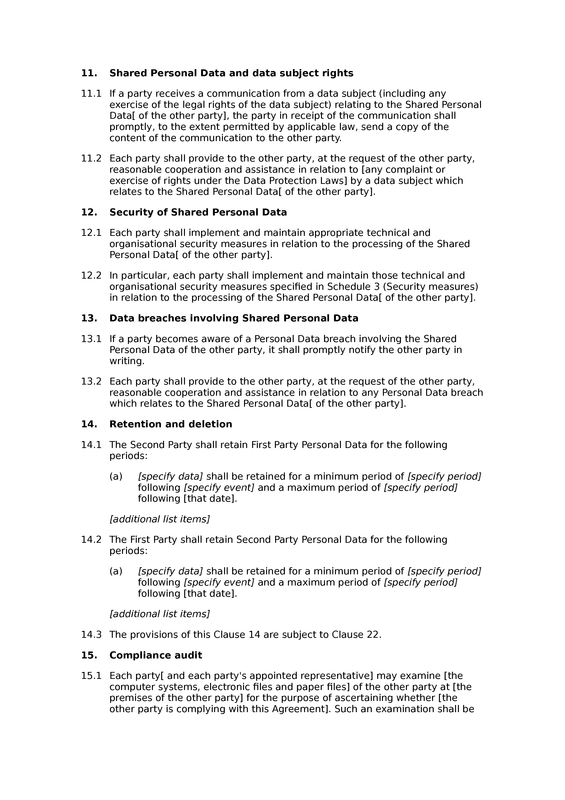 The operative provisions of this data sharing agreement cover (amongst other things): (i) obligations to comply with the GDPR and other applicable laws; (ii) limits on further disclosure of shared data; (iii) international transfers of data; (iv) issues relating to supervisory authorities and data subject rights; (v) security of shared data; and (vi) the handling of personal data breaches. 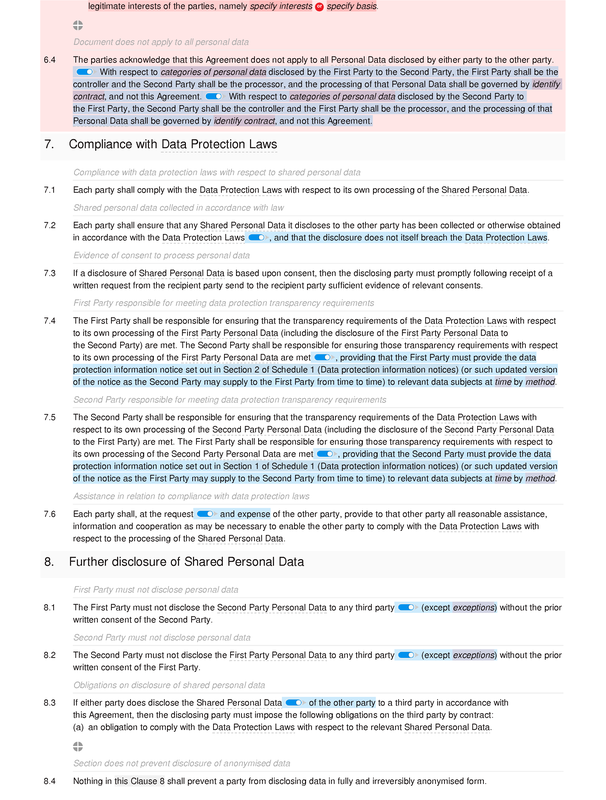 This document is not specifically designed to cover the sharing of special categories of personal data; nor should it be used for controller-to-processor sharing. 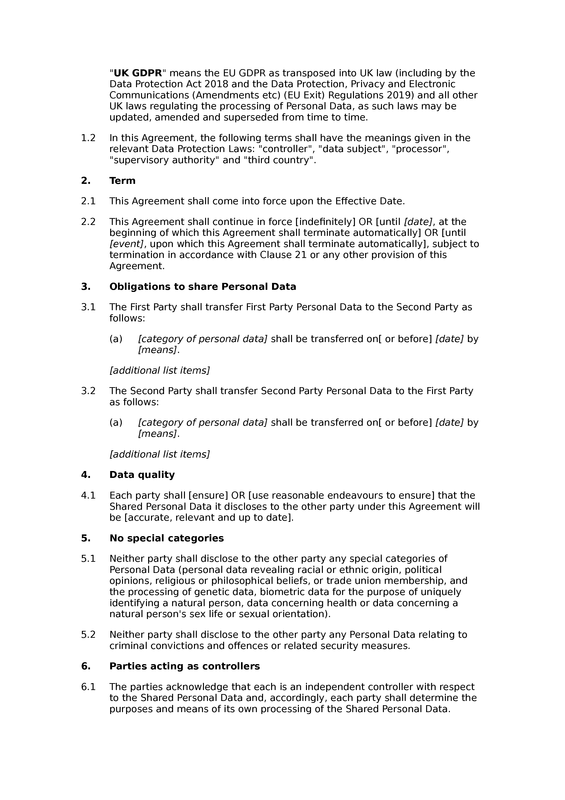 Definitions: definitions; data protection terms. 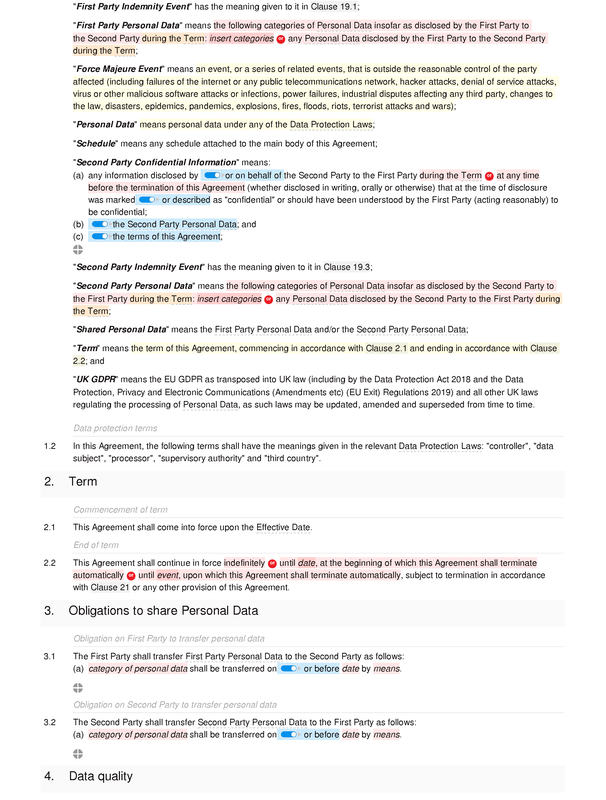 Data quality: parties to ensure data quality. No special categories: no special categories of personal data to be shared; no criminal conviction data to be shared. Parties acting as controllers: each party is independent controller of shared personal data; purposes of processing shared personal data (independent controllers); legal bases of processing shared personal data (independent controllers); document does not apply to all personal data. Parties acting as controllers: parties are joint controllers of shared personal data; purposes of processing shared personal data (joint controllers); legal bases of processing shared personal data (joint controllers); document does not apply to all personal data. responsible for meeting data protection transparency requirements; assistance in relation to compliance with data protection laws. 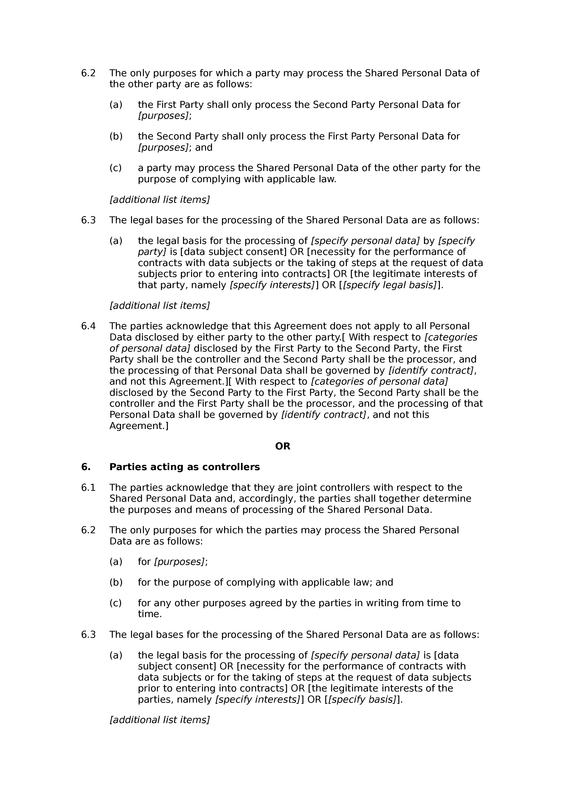 must not disclose personal data; obligations on disclosure of shared personal data; section does not prevent disclosure of anonymised data; section does not prevent disclosure of personal data to processors. Shared Personal Data and supervisory authorities: communications from supervisory authorities about shared personal data; cooperation in relation to supervisory authority action. 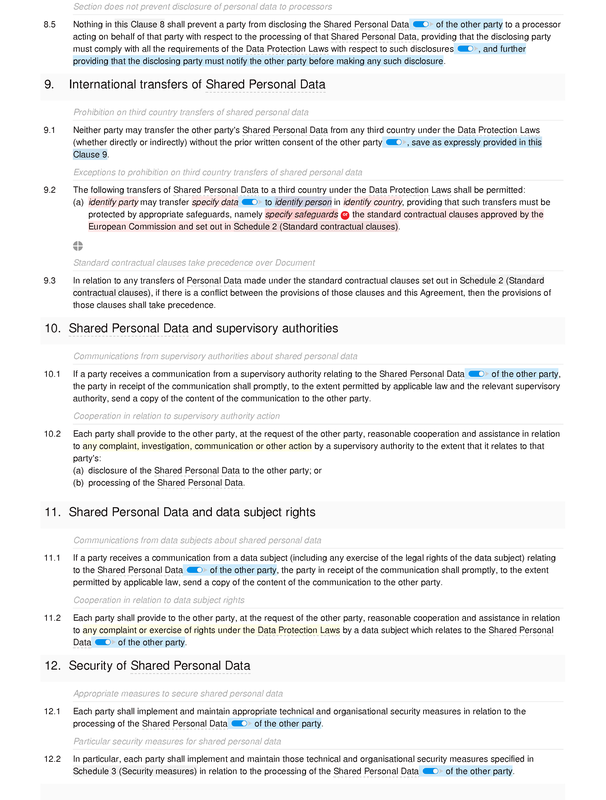 Shared Personal Data and data subject rights: communications from data subjects about shared personal data; cooperation in relation to data subject rights. Security of Shared Personal Data: appropriate measures to secure shared personal data; particular security measures for shared personal data. Data breaches involving Shared Personal Data: notification of data breaches involving shared personal data; assistance in relation to shared personal data breaches. 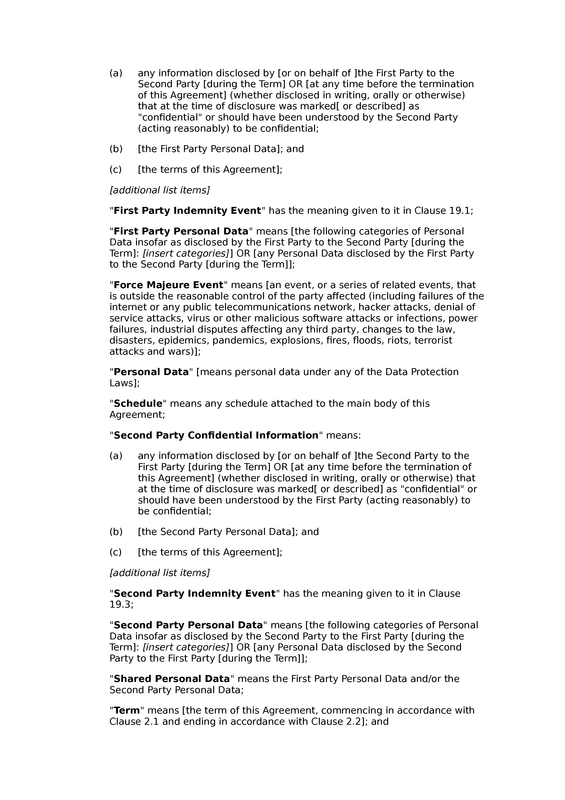 personal data; section subject to effects of termination. Compliance audit: right to audit compliance; notice of audit; cooperation in relation to audit; costs of licence audit; limits on audit right. Changes to Data Protection Laws: changes to data protection law. 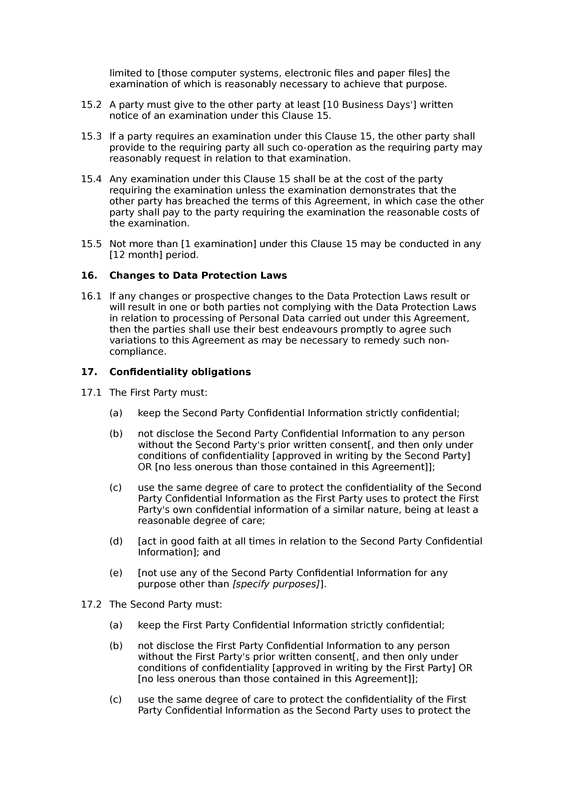 Confidentiality obligations: first party confidentiality undertaking; second party confidentiality undertaking; disclosure of confidential information to certain persons; exceptions to confidentiality obligations; disclosures of confidential information mandated by law etc; confidentiality obligations after termination. Limitations and exclusions of liability: caveats to limits of liability; interpretation of limits of liability; no liability for force majeure; per event liability cap. Effects of termination: parties to delete shared personal data; surviving provisions upon termination; termination does not affect accrued rights. Interpretation: statutory references; section headings not affecting interpretation; no ejusdem generis. Prompt for standard contractual clauses.